Business enterprises always find better ways for team communication and collaboration. Instead of writing heavy emails daily, chat simplifies team conversations and organizes team tasks more efficiently. Many chat apps for teams ensures a wide range of collaborative features for quick communication. And that is exactly where instant business chat apps need to be deployed. Team chat apps are carved out to provide functionalities essential for communication in team projects. However, choosing the right team chat app among the hoard of such apps can be a tedious task involving a lot of time. Therefore, to save time–the most precious possession these days–we’ll provide an overview of some of the best chat apps that businesses should deploy for better communication in team projects. Attain optimum communication at your workplace with the new instant messaging collaboration application-The Troop Messenger. The design idea of Troop Messenger is to collaborate, share, and communicate new thoughts among fellow employees of every organization. Small, medium, large or any size of organizations can give a sure try of Troop Messenger for their endless office chat communication and collaboration. 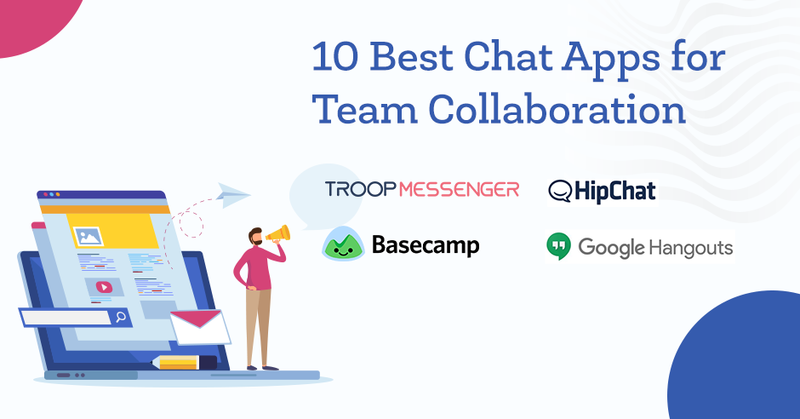 Tech Times, Newyork, had listed Troop Messenger as one of the best Instant Messenger For Businesses In 2019. Troop Messenger is a cross-platform application, as it is available on iOS, Android, Mac, Linux, and Windows. The best part is that it is available in three pricing plans. Its sign-up process is completely hassled free. Anyone can download it for free and start their hands on the application. Hipchat was one among the highly popular instant one-on-one messaging team collaboration application until it was acquired by Slack-Atlassian. Almost every small and large organizations heavily relied on it for their in-office communication. Once Hipchat was known to be a tough competitor of Slack, now shutting down its operations and slowly migrating the users to Slack. Atlassian tried to stay competitive with a new product called Stride, but unlike Hipchat Stride could not pull more traction from the users. Current users of Hipchat can continue the use of service until February and can move on to Slack. The campfire was merged with Basecamp sometime back but continues to offer some of the best features for team projects. It is considered as a group chat tool for Internet-based companies by allowing managers to assign tasks, group notes, and download files. Besides, it also offers regular chat features such as group chat and conference calls. It is priced at only $99 a month, and whether one has a team of 5 or 50, that price doesn’t change.